Aleksandra Dionisyevna Danilova (Russian: Александра Дионисьевна Данилова; November 20, 1903 – July 13, 1997) was a Russian-born prima ballerina, who became an American citizen. In 1989, she was recognized for lifetime achievements in ballet as a Kennedy Center Honoree. Born in Peterhof, Russia on November 20, 1903, she trained at the Russian Imperial Ballet School in Leningrad (formerly and currently St. Petersburg). She was one of the few Russian-trained ballerinas to tour outside Russia. Her first professional post was as a member of St. Petersburg's Imperial Ballet. In 1924, she and George Balanchine left Russia. They were soon picked up by Sergei Diaghilev's Ballets Russes; Danilova as a dancer, Balanchine as a choreographer. 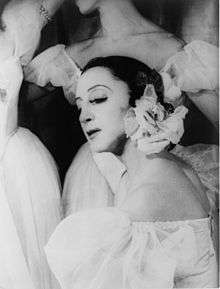 Danilova toured for years with the Ballets Russes under Sergei Diaghilev, then with the Ballet Russe de Monte Carlo after Diaghilev's death. With the latter company, Danilova and Frederic Franklin created one of the legendary ballet partnerships of the twentieth century. Danilova became known for her glamour and beautiful legs, as well as her work ethic and professionalism. The Ballet Russe de Monte Carlo presented Gaîté Parisienne in the U.S. for the first time at the Metropolitan Opera House, New York, on 12 October 1938, with Danilova as the Glove Seller. Portraying her as a vivacious, glamorous, sophisticated woman of the world, Danilova in Gaîté became one of the attractions of the Ballet Russe, and the ballet often concluded a season's opening-night performance. On the opening night of the company's 1941 season in New York, when Danilova made her first entrance she was given a spontaneous ovation that stopped the show. Such show-stopping ovations thenceforth became a tradition of every opening-night Gaîté with Danilova. Danilova made her Broadway debut in 1944's Song of Norway; her last ballet performance was in 1957. She made her musical comedy debut in 1958 in Oh, Captain!. She appeared in a single scene, a dance with the show's star, Tony Randall. (A year later, they performed it on an episode of The Dinah Shore Chevy Show, thus preserving it for posterity.) Unfortunately, Oh, Captain! was not a commercial success and closed a few months later. She was in financial straits when she came across Balanchine on the street in 1964. When he heard of her plight he instantly hired her to teach at the School of American Ballet. In 1965, she sought and received approval from Balanchine to produce a spring workshop performance for the students. These workshops became an important preview for many outstanding dancers. Danilova remained there until her retirement in 1989. In 1972, she staged a New York City Ballet production of the romantic ballet Les Syphides, under the original title, Chopiniana. Two years later, in 1974, Balanchine choreographed a version of Coppélia for the New York City Ballet. He was assisted by Danilova, who had performed the title role many times during her dancing career. She staged the Petipa choreography for Act II. Danilova had a small role but nostalgically delightful role (especially for those who knew her earlier work) in the 1977 movie The Turning Point as a ballet coach for upcoming ballerinas. In 1986 she published an autobiography called Choura, her own personal nickname. The book won the 1986 de la Torre Bueno Prize. She had a long intimate relationship with Balanchine after his divorce from Tamara Geva, from 1926 to 1933, but they never married. They continued their professional partnership long after their romance ended. Danilova never married. In Hugh Martin's Look Ma, I'm Dancin' of 1948, a disillusioned would-be dancer contrasts her skills with the talents of some of the leading ballerinas of the day, including Markova and Pavlova. The song includes the line "And as for Alexandra Danilova, I know I'll never make a schlemiel of 'er." Danilova died on July 13, 1997, in New York. She had a Russian Orthodox funeral service, and was interred at Oakland Cemetery, Sag Harbor, Suffolk County, New York — the same cemetery where George Balanchine is buried. 1 2 3 4 Anderson, Jack (July 15, 1997). "Alexandra Danilova, Ballerina and Teacher, Dies at 93". The New York Times. ↑ "Son to Mrs. Kazimir Kokich", The New York Times, November 26, 1958. 1 2 Dunning, Jennifer (May 22, 1989). "Ballet School Gala Benefit Is a Farewell For Teacher". The New York Times. ↑ "Alexandra Danilova," Kennedy Center website; accessed July 1, 2015. 1 2 Gregory, John (July 15, 1997). "Obituary: Alexandra Danilova". The Independent. Retrieved September 8, 2013. ↑ Balanchine and Mason, 101 Stories of the Great Ballets (1989), p. 183. ↑ Franklin, interview (2004), Gaîté Parisienne, a film (1954) by Victor Jessen on DVD (2006). ↑ Anderson, The One and Only: The Ballet Russe de Monte Carlo (New York: Dance Horizons, 1981), p. 18. ↑ Macaulay, Alastair (May 30, 2012). "Recreating Lost Instants in a Reconstructed Ballet", nytimes.com; retrieved May 31, 2012. Alexandra Danilova papers, 1954-1989 Manuscripts and Archives, New York Public Library.